For those who don't know, unlocking Nexus S bootloader will allow you to go into custom recovery mode so you can install custom ROMs like Cyanogen Mod etc. The steps are pretty easy but you need to have the basic Android fastboot knowledge. 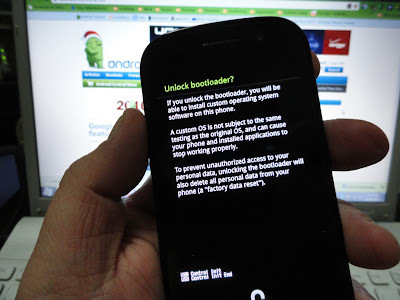 Just follow the step by step guide below to unlock your new Nexus S bootloader. STEP 1: Shutdown your Nexus S.
STEP 2: Hold down the Volume Up key then hold the Power key. STEP 3: Now your device'll get in Standard Recovery Mode. STEP 4: Now ppen command prompt or Terminal (depending on what OS you’re using, this is on your computer) then type “fastboot devices”. This will tell you if your phone is connected via USB or not. STEP 5: Type “fastboot oem unlock” if you're connected. STEP 6: Almost done, now use Volume keys to select ‘yes, unlock bootloader’ then use power button to select option and your new bootloader will be unlocked now ! For now, there is no custom recovery image yet and obviously no custom ROMs but they'll be out very soon.